Shakespeare said “A rose by any other name would smell as sweet.” But would an email about that rose, by any other name, get as many opens or clicks? Having solved most of the technical issues with email, from deliverability to getting videos to play in the inbox, email marketers are starting to slowly turn their attention to the linguistics of a great email campaign. Once the provenance of academics and zealous editors and copywriters, statisticians and analysts are jumping on board to find an effective and meaningful application of linguistics and word choice on the behavior of consumers, often with startling results. For today’s OnTraq blog post, we wanted to look at the evolution of the study of marketing language and draw some inspiration and get a few actionable tips out of the deal. The practice of optimizing content to solicit a direct response from customers started shortly after Aaron Montgomery Ward started the first direct marketing campaign in 1872 by sending his catalog directly to consumers. It wasn’t until the mid 20s-30s though that a more standardized approach became common among copywriters. Advertising agencies, and even individual copywriters, began compiling “swipe files”: essentially a greatest hits of messaging along with analysis of why particular words and phrases performed well. It wasn’t until the late 60’s that a more rigorous scientific approach began to take shape, with the rise of psychographics and consumer profiling. These days, the study of words and meanings as they relate to marketing is a deeply entrenched scientific endeavor. Statistical analysis of the connections between certain phrases and email performance have become a big deal over the last several years, and the reason behind today’s post. MailChimp an ESP for local businesses, studied the health of the “daily deals” market. But what do daily deals have to do with content optimization? Perhaps the biggest point of interest from a content optimization standpoint of the daily deal craze is the sheer volume of emails sent. This large volume makes for a great basis to do linguistic analysis on, and allows us to draw conclusions with an adequate statistical validity. After concluding their initial exploration into Daily Deals, the staff at MC ran some analysis on the contents of the emails these bulk senders placed in inboxes. The results are a little surprising. Let’s start with their look at food words: interestingly, but not very usefully, there is a slight positive impact on CTRs in emails containing the word “chocolate”. That’s not surprising, though, since everyone loves chocolate. What IS surprising is that there is a much stronger negative impact with the word “vanilla”. While this type of analysis doesn’t give us any indication of why this may be, we can theorize that vanilla has an idiomatic meaning (bland, boring, run-of-the-mill), and since we don’t know the context the word was used it, it’s possible that the analysis counted the idiomatic usage along with the flavor. Take Away: keep in mind that certain words have certain connotations, and always take that into account when composing email messaging. The other interesting discovery in the foods section, and one that we feel translates to other categories, is the preference for specificity. Subscribers were much more likely to respond positively to specific food items (e.g. sushi, hamburgers, bacon) than they were to the meals these items were a part of (e.g. breakfast, lunch, dinner). Take Away: Specificity increases relevance to consumers. While “lunch” is an abstract idea that carries different meanings for different people, “hamburger” is a very specific thing with a very specific meaning and a much higher degree of relevance to someone looking for hamburgers than the word “lunch”. Getting specific markedly increases the odds that your message will be found interesting by subscribers, especially subscribers who have are considered “intenders” or more likely to convert. A chart with “Common Daily Deal Words” is also of exceptional use to email marketers, and seems to disprove a very common misconception: that the words “free” and “win” are anathema to email subscribers. A lot of email marketers still believe that messages with those two words are automatically rejected as spam, either by inbox spam detection software or by subscribers themselves. On the contrary, the study seems to point to “win” being very highly correlated with increased CTRs, and “free” is neutral, neither helping nor hurting. “Coupon” also has a positive correlation. “Deal” and “Value”, two words that many marketers see as being very positive, on the other hand, are in fact correlated with a decrease in CTRs, along with “Buy”. Take Away: While it’s fair to have concern about words like “free” in a subject line, sometimes it pays to question conventional assumptions about what words are and aren’t ok to use. Look to the data rather than to “common sense” or “industry standards” to determine how you phrase your messaging. Things change constantly in the delivery side of the email marketing business. The last thought we want to leave you with is one that measures email effectiveness against common emotion words contained in the email. Seconding a theory that psychologists have been putting forward for a while now, the study finds that people react much stronger, as measured through their propensity to click a link, to negative emotional words. Words like “Terrible”, “Bad”, “Sad”, and “Angry” get a much stronger reaction out of people than “Smile” or “Happy”. Take Away: Don’t be afraid of negative emotions in your messaging. In fact, it may help your email marketing perform better than ever. 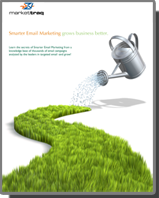 Smarter Email Grows Business Better guide. Want better returns from your email marketing? Sign up for information and we'll send you our free E-Book: "Smarter Email Marketing Grows Business Better." Please review the form to ensure that all fields are properly completed.